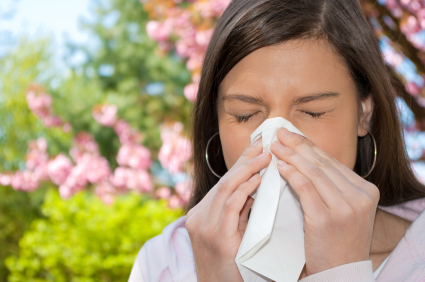 Are you being affected with seasonal allergies now that warmer weather is approaching? Consider getting Acupuncture treatments to help bring relief. Acupuncture can boost the immune system quickly. There are specific Acupuncture points that can be used to help affect allergies, colds and flu and bring some relief. There is also an Acupuncture point that can help with phlegm. Focusing on this point will help your body get rid of excess mucus. Many allergy sufferers also find that medications become less effective over time and have a host of unpleasant side effects. It can certainly be tempting to reach for allergy medications (typically anti-histamines and bronchodilators). But these suppress your immune system and do nothing to alleviate the underlying issue. Plus, do we really want to suppress our immune system? While there are some specific points that can help with allergy issues, in general all acupuncture points can help strengthen the immune system, regulate the body and improve circulation. All together this can help the immune system get stronger and you stay healthier. Have you had the flu or too many colds this past season and are now being affected with seasonal allergies? Give Acupuncture a try. Give us a call at Acupuncture Alternatives – 480-671-5178.